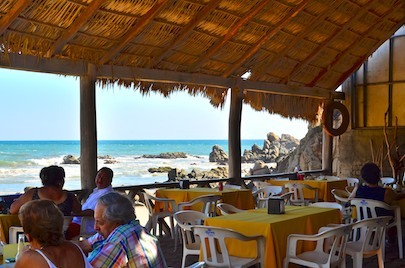 Late December, 2012 – In the middle of our unbelievable 24-hour visit with Ron and Jackie and their friends at Las Palmas Resort, we took a quick, late afternoon drive out to La Bocana, a rugged and wild beach at the mouth of a river a few miles south of the Bays of Huatulco, Mexico. 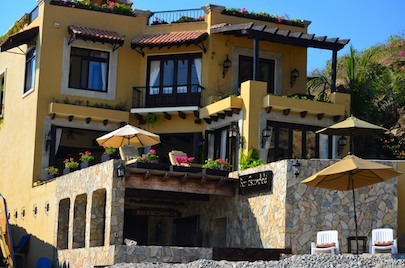 This beach is nothing like the beaches in the more northern bays where the ocean politely laps the sand with small, harmless waves while the palapa beach bars bring margaritas, chips and salsa right down to the water’s edge. 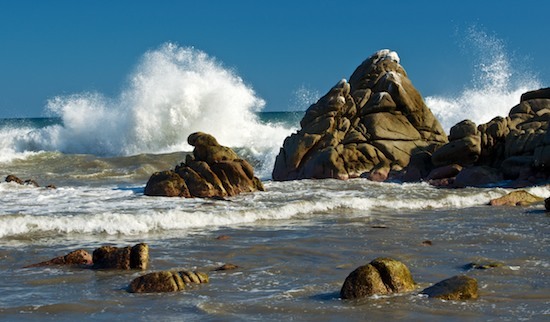 La Bocana is a primal place of craggy rocks and exploding surf. 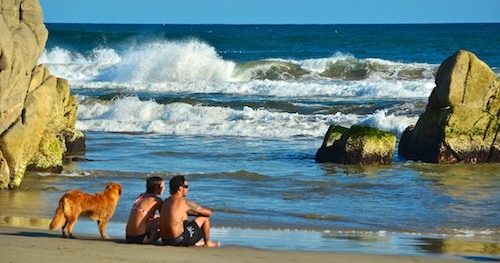 There is a beach bar or two, but they are placed safely away from the breakers that mercilessly pound this beach. Their structures are built soundly to survive the crazy hammering the ocean delivers here whenever the Tehauntepec is blowing. The sight of the huge white waves got us running across the beach, and the blazing hot sand kept us moving at a sprint until we reached the cool tidal sand on the edge of the water. Back on the boat in our anchorage in Santa Cruz Bay, we hadn’t noticed much ocean swell or many ominous waves, but here the waves were rolling in relentlessly, erupting against the rocks with awe-inspiring force. 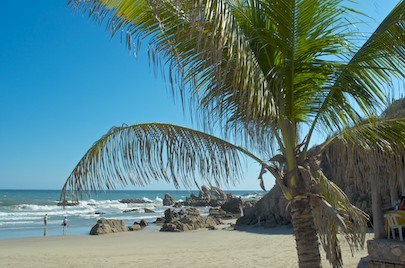 Playa La Bocana shows off Huatulco’s wild side, and we got a full display both that afternoon and on another day a few weeks later when we returned. There is something alluring about seeing Mother Nature unleashing her fury. But here it happened in incongruously warm and friendly sunshine. 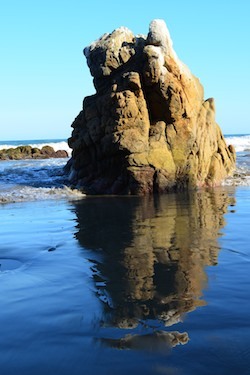 As the tide went out, the water receded and left the most beautiful mirror images of the sawtooth rocks in the sand. Mark and I dashed around trying to line up the rocks and their reflections while a group of snowy egrets on winter break from Canada walked along the edge of the water. They snatched up whatever they could find to eat in the sand each time a wave drew back into the sea. 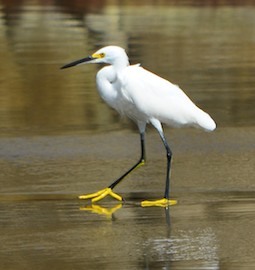 Looking for dinner – in yellow shoes!! 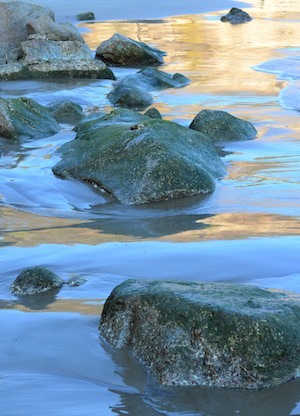 In places the water had an almost silky look, giving the rough rocks a smooth, glassy sheen. We were mesmerized by the steady roll of the waves in and out, and the way they left a glistening luster on everything as they withdrew. We loved the contrast of the polished, shiny surfaces and the tranquility in this one part of the beach and the savage, chaotic froth and foam in the other. 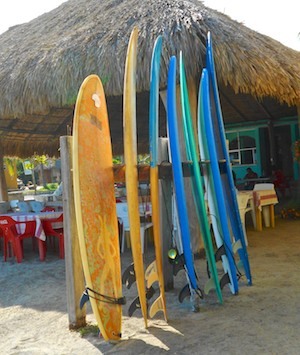 Since we’ve started cruising we’ve learned that ocean swells come in sets of five to seven waves at a time. Each wave grows larger than the last until you get a few real crashers, and then each one shrinks a little smaller until a few roll in that have no personality at all. The Aussie owner of one of the beach bars told us that even though he loved surfing in his homeland, he sure liked catching the waves here. 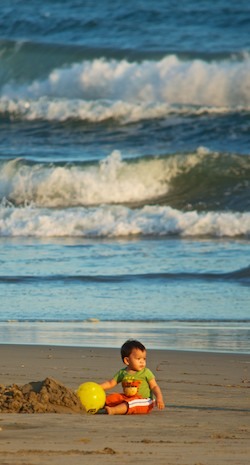 He had surfboards of all kinds and was raising his young son to love the wildness of the ocean too. Summertime waves are the biggest and the best around here, he told us, but even now in December the waves seemed plenty big enough to us. 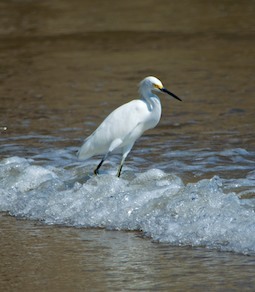 Besides jagged rocks and surf, the wildlife is abundant at Playa La Bocana as well. 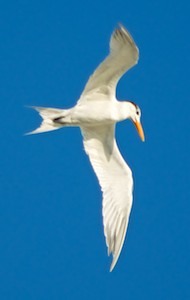 Frigate birds, terns and herons all took their place along the water’s edge according to their particular tastes. Frigate birds go fishing by swooping down and grabbing unsuspecting fish near the surface of the water in their beaks, while terns take death defying dives straight down into the water, beak first. 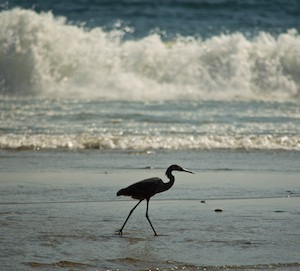 The herons and egrets walk daintily on their stilt-like legs, bravely stalking the sea as the waves fall back and then scurrying to the safety of high ground when the next wave strikes. 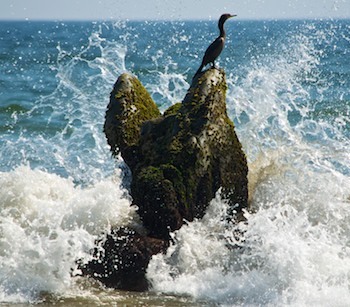 A few cormorants did long dives below the surface and then hung out on the rocks to dry off and ponder their next move. At the far end of the beach a huge flock of gulls and terns stood just out of reach of the crashing waves, all facing the late afternoon sun. Their reflections in the watery sand beneath them made them seem double in number. 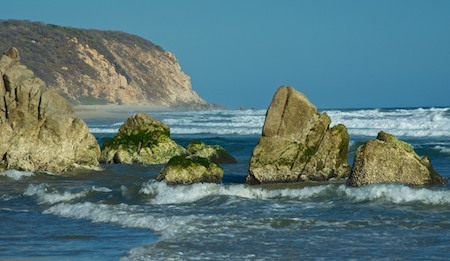 La Bocana (“The River Mouth” in Spanish) is the mouth of the Copalita River where it rushes down to meet the sea. 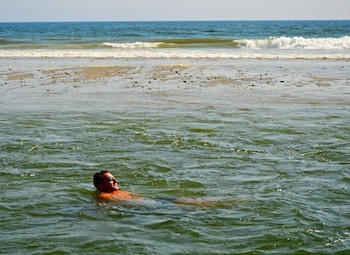 The current is very fast, and our friend Craig jumped in the chilly water upstream a bit and went for a very fast ride. We learned that the river changes course every so often. Some years it carves a path to the ocean one way, and other years it carves a path another way. Ron remembered seeing the river flow at least 50 yards north of where it was flowing now. No matter which way it decides to go, this is a fast moving body of water, and lots of folks take rafting trips down the river from points way upstream. 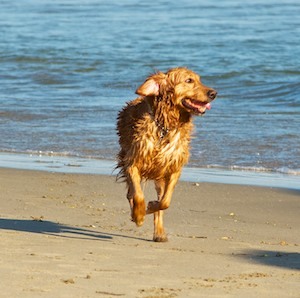 As we walked back along the beach, we came across a young couple enjoying the view and the beauty of the afternoon with their golden retriever. They leaned in close and shared a quick kiss in the golden sunlight, and then their dog took off on a playful romp, running at full speed all around them. 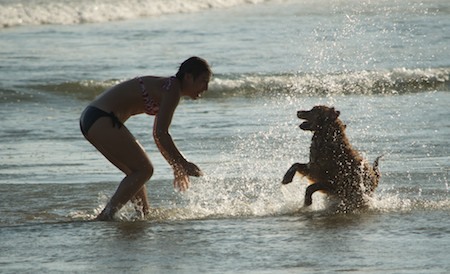 This dog was as happy as any dog can be, playing in the waves with his mistress and master. They ran and threw a ball for him and splashed and ran some more. We ran after them and got caught up in the fun of the moment, watching this young couple in love as they played and laughed with their dog on the beach. Talking with them later, we discovered they were down here from Mexico City, enjoying some beach time away from the cold winter in the mountains. 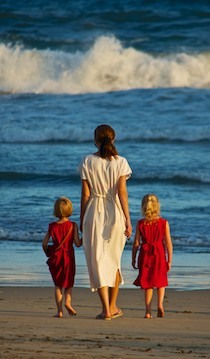 A few other families showed up as the sun began to fall towards the sea. 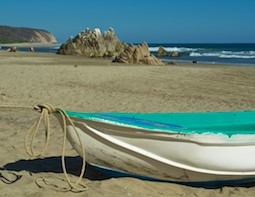 This is a wonderful beach for strolling, communing with nature and letting your thoughts fly free. 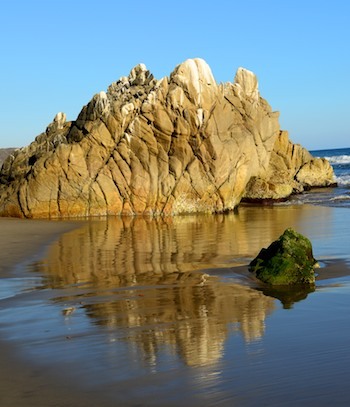 Unlike some of the other beaches in Huatulco where the pleasures are a little slower paced and more peaceful — snorkeling, swimming and basking in the sun — this is a beach that begs for action and play. Body surfers struggled to conquer the waves, getting 10 second thrill rides in return for many minutes of plowing headfirst into the breaking waves. What a rush! A dad played soccer with his toddler son, gently kicking a ball across the sand until the little boy finally plopped down and hugged the ball, his short legs tuckered out from all that running. We settled in for a cold drink at one of the beach bars. Slowly, as the sun sank out of sight, all the beach-goers came came up to to get a snack or dinner. The only drama left was Mother Nature at her finest. 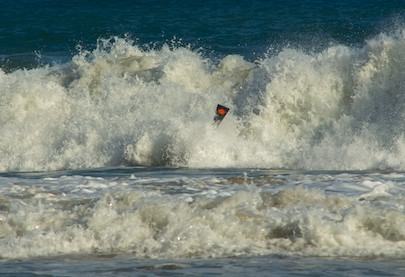 The huge, incessant waves didn’t care that the sun was gone. They just kept on coming and coming in a rhythmic show of force that faded from view as darkness fell. How eerie it was to hear the breakers thundering so close, bombarding the beach in front of us in endless roars of invisible spray. We returned to our little anchorage in Santa Cruz Bay to find that the whole village was quickly being caught up in the festive spirit of the holidays.